Something you see commonly in games and interactive user interfaces is this notion of some piece of UI reacting to a mouse click or finger tap. In this example, I highlight one such reaction - the famous move element to the click position. There should be no surprises there! In case you want to see this example in isolation, you can view it in its own page. As usual, take a few moments and try to understand how the example and the code that makes it up are related. After you've done that, let's walk through this example together. The way this example works is pretty straightforward. The only real complication is in calculating the exact pixel value of the click location, but we'll cross that bridge when we get there. Let's look at how everything works. Setup an event listener that calls getClickPosition each time you click inside the contentContainer div element. Calculate the exact position of the click. Set our image's left and top position properties so that our transition kicks in. 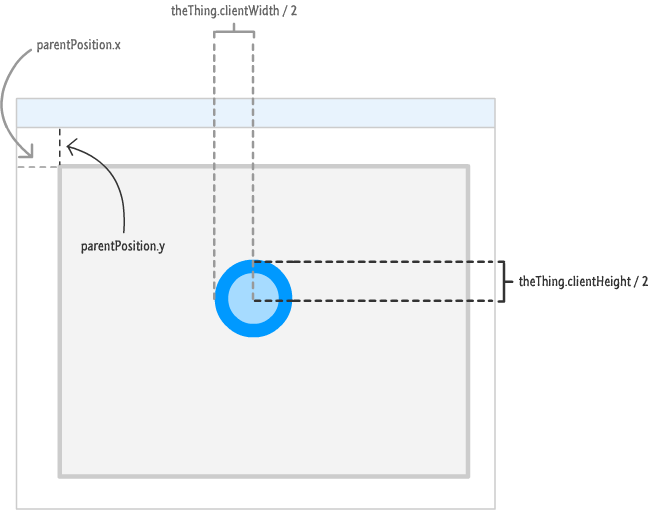 Calculating your mouse's exact click position, taking into account any offsets the parent container introduces, and factoring in the center point of the image you are trying to move isn't the simplest of things to visualize. The reason is that each of these offsets is calculated differently. Your mouse click position (e.clientX and e.clientY) is relative to your browser's top-left corner. The global position of the mouse click is subtracted by the parentPosition's offset and half the width and height of the image. This ensures that the center of our image stops at the exact point of our click. The final value is stored by the xPosition and yPosition variables. The moment the new values get assigned, our CSS transition kicks into high gear because it is just waiting for the left and top properties on our image to change.